Across Minnesota, older homes and barns are being demolished to make way for new buildings or farmland. When buildings are demolished, harmful chemicals and pollutants—like lead and asbestos—are released in the air. 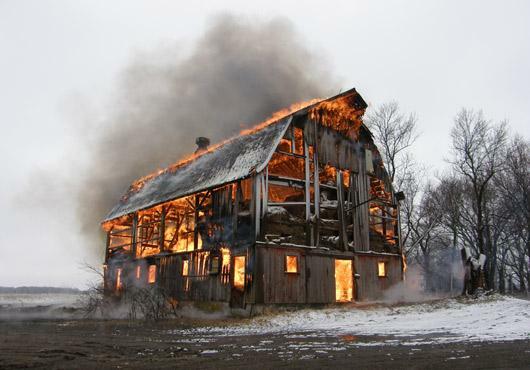 In addition, when buildings such as old barns are burned, the old-growth wood is not only wasted, but it produces noxious smoke that’s harmful to human and environmental health. Recently, the Minnesota Pollution Control Agency has been trying to educate the public about the growing issue of demolishing and burning buildings. The organization suggests that demolished building materials, such as concrete and wood, be turned over to specially permitted facilities for proper disposal. Yet a better solution is gaining steam across the country: deconstruction and reuse. Many buildings, especially those built before 1978, contain harmful lead and asbestos. Deconstruction carefully removes all building materials for safe recycling and reuse–greatly reducing the amount of waste in the landfills and avoiding hazardous plumes of lead and asbestos that occur from typical demolition. In addition, deconstruction supports public health by reducing the additional greenhouse-gas emissions that come from adding to the landfill. On average, construction and demolition materials account for a quarter of the waste in all landfills. In Minnesota, more than 80 percent of the 1.6 million tons of construction and demolition waste was landfilled in 2013. According to the EPA, for each ton of construction and demolition waste (2,000 pounds) that goes into a landfill, 2.79 metric tons of carbon dioxide equivalent greenhouse gases, including methane and CO2, are released into the atmosphere. Through deconstruction with a specially trained crew, as much as 90 percent of of this waste can be recycled or reused, and sold below retail cost in places like Better Futures Minnesota’s ReUse Warehouse. Learn more about how deconstruction at Better Futures Minnesota is creating jobs, protecting the environment, and supporting a healthier Minnesota!